Mt. Shasta is California’s premier, stand-alone, 14,000-foot mountainwith the largest and longest glaciers in the state. Along with Washington’s Mt. Rainier, Mt. Shasta is one of the two most prominent large mountains in the contiguous United States. Shasta is sought after by so many climbers and skiers nationwide because it offers such a wide variety of routes, especially moderate ones for the aspiring mountaineer and backcountry skier. Mt. Shasta is California’s premier, stand-alone, 14,000-foot mountainwith the largest and longest glaciers in the state. Shasta is sought after by so many climbers and skiers nationwide because it offers a wide variety of routes, especially moderate ones for the aspiring mountaineer and backcountry skier. The fully updated fourth edition of Mt. 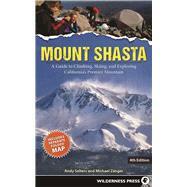 Shasta, by Andy Selters and Michael Zanger, is the most comprehensive, detailed guide and overview to a large, varied, historic, and coveted mountain for climbing and skiing. The guide offers extensive details on dozens of trips both on the mountain and in its surroundings, including weather, climbing and skiing conditions, amenities, and history. A special extra is a guide to Shasta’s superb circumnavigation at timberline, pioneered by John Muir, that is often referred to as one of the best off-trail hikes in the Northwest. The book also comes with a topographic map showing all mountain routes and variations.